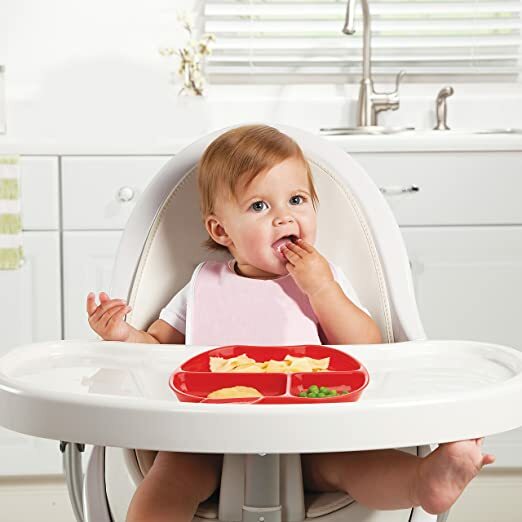 Are you getting ready to move from liquids to solids or is your toddler already feeding him/herself and now you are on the search for the best toddler plates available. Big, clumsy, and breakable are not what you need. And while your toddler deserves his or her own dinnerware, like everything else there are plenty of options to choose from when it comes to toddler plates. You may find yourself wondering what the best and most popular plates are, so we’ve done the work for you so there’s no more guessing. This guide will help you choose the best toddler plates. Let’s get this one out of the way first. The first thing you should avoid when purchasing any kind of dishes for your child is whether or not the plate contains BPA. Bisphenol A (BPA) is a chemical that is used in plastics and research has shown that the BPA can seep into foods and beverages from containers that are made with it. Because the studies of the types of damage it can cause or how long it takes for any effects to be known, it is better just to avoid any product(s) that contain BPA. So look for that BPA-Free label. You also have the choice of avoiding plastic and going with silicone, stainless steel, wood, and/or glass. Each of these is a great alternative. Doesn’t Your Child Deserve the Best Toddler Plates? 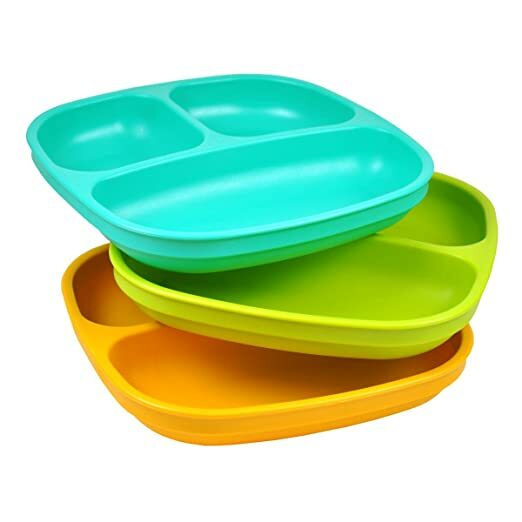 As stated above, there are other options when it comes to choosing the best toddler plates besides plastic, because even if the plastic is BPA free, there is still the risk of harmful chemicals being used. Most parents of young children don’t think of glass being a viable option, especially if your child’s favorite thing to do at mealtime is thrown the dishes on the floor. Stainless steel is also an option as it’s both sturdy and hygienic and now comes in fun patterns. Silicone is another option as silicone kitchen products have been gaining in popularity over the last few years and are now being made into the toddler dinnerware. The silicone used in dishware is also petroleum free, which adds to the appeal. Bamboo is another alternative. Bamboo is a natural product and renewable, so those who are more environmentally friendly can look at this as an option. Now that you’ve eliminated plates that contain BPA it’s time to choose the best toddler plates for your child. It’s a pretty safe assumption that if your child is a thrower, a Hulk in training so-to-speak, you may want to avoid glass. While tempered glass is stronger than regular glass, it can and will still break. What you might consider looking at our plates that suction to the table or high chair, thus helping to eliminate the throw factor. Another thing to keep in mind when choosing plates for your toddler is do they need to be dishwasher safe? Bamboo is not recommended for the dishwasher because of the high temperatures and it’s also not a good material to leave soaking in a sink full of water. So these two limitations may be what eliminate bamboo from being a choice. So, BPA-free plastic, stainless steel, and silicone are most often dishwasher safe (read product description just to make sure) and can be left soaking in a sink full of water. When purchasing something that your child is going to be eating off of, keep in mind that not every country has the same regulations and restrictions when it comes to what is and what is not safe to use in children’s products. The United States has stricter guidelines than say China when it comes to food safety and what they consider safe ingredients. It’s always a good idea to try and buy from the country of your origin because it gives you the peace of mind that your countries safety regulations are being met. So look for that Made in America stamp of approval. Rated a 4.5 out of 5 stars on Amazon, this OXO Tot Big Kids Plate with Non-Slip Base is the perfect plate for both training and transitioning your toddler. The non-slip base keeps it in place and the wide edge is easy for small hands to hold onto. It’s durable and dishwasher safe (top rack only). While they are microwave safe, if placed in for longer than specified on the bottom of the plate it compromises the plastic. These Ikea Kalas plates rated 4.6 out of 5 on Amazon. 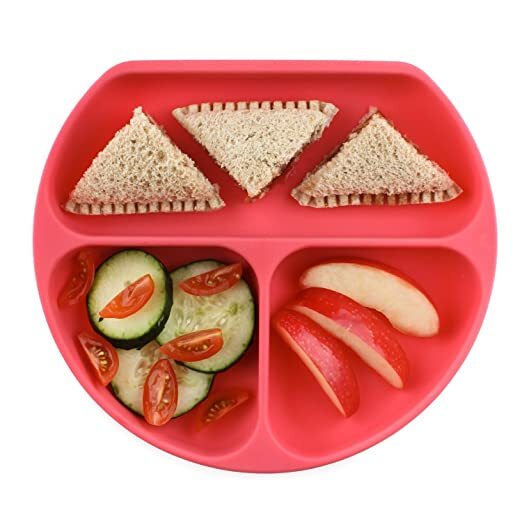 These plates are BPA free, come in a package of six that stack easily and are both microwave and dishwasher safe. The high edge of the plate makes it easier for the food to stay on the plate instead of getting pushed off the side. While they are microwavable you cannot use them on high heat as there are heat specifics on the back of the plate. Bumpkins Silicone Grip Dish has a 4.5 out of 5-star rating on Amazon. It’s great for toddlers just learning to feed because of the high edges. Made with food-grade silicone it’s durable, easy to clean and stain resistant. Best of all, it’s dishwasher safe. These cute BPA-free apple shaped plates come in a pack of three and rate a 4.6 out of 5 on Amazon. They have three sections with sloped sides for easy scooping and are easy to stack and store. Re-Play Divided Plates rated a 4.7 out of 5 on Amazon. 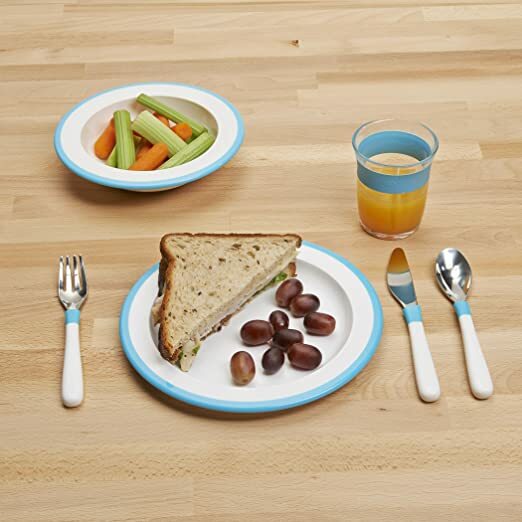 These plates are BPA, Phthalate, PVC, and Melamine free and dishwasher safe. Each plate has 2 small and 1 large section with deep sides for easy scooping. These plates are made in the USA and made from FDA approved for food content recycled milk jugs. BPA, Phthalate, PVC, and Melamine free. Made from recycled products thus reducing greenhouse gasses and saves energy. In reviewing the five products above, the clear winner would be the Re-Play Divided Plates that rated 4.7 out of 5. 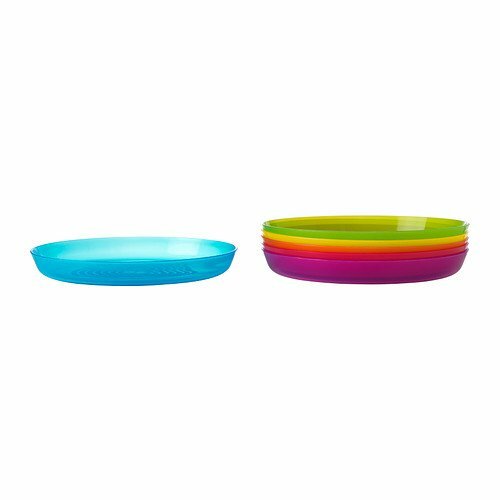 Not only are these best toddler plates free, but they are phthalate, PVC, and melamine free as well. And while they are not recommended for use in the microwave, only two of the five reviewed were, and only at a low temperature for a short duration. So this wasn’t a deal breaker. The biggest reason this plate was the clear winner, and it’s not only because it has the highest rating of the five at a 4.7, but because it is made in the USA. Not only that, but it’s made using recycled FDA approved milk jugs, and because it’s made with recycled plastic this helps to reduce greenhouse gasses and saves energy.